Career as a player - Started playing football at 11/12 years of age up until the age of 19 years, always playing for San Gwann F.C. Following that period Xavier spent some time enjoying only 5-a-sides with friends and it was then that he started his career in Futsal. He started off playing with a 3rd division team but it was nothing serious until season 2007/08. In this season, Xavier started playing Futsal in the 1st division with Pentagon F.C. and won promotion to the Premier division as champions and with himself finishing as top scorer. Xavier played the following season with the same team and it was a memorable one for him as he was called up to represent our country when he was chose with the National Team. Following that season, Xavier joined another club, Paola downtown F.C. and eventually Hibernians F.C for another 3 seasons. Out of 5 seasons with the teams from Paola, Xavier was captain for 4 seasons and one the National league once. During season 2014/15 Xavier joined Valletta Futsal Club. in the Premier division for whom he was captain of the Club. During Season 2015/16, Valletta won the premier division and Xavier was crowned champion once again. Together with Valletta Futsal, Xavier represented our country in the Uefa Futsal Cup in August 2016. The following season, Valletta ended the season as runners up in the league. In Season 2017/18, Valletta Futsal appointed Xavier as Player/Coach. It turned out to be yet another memorable one for Xavier as in his 2nd spell as coach of the Club, Valletta Futsal were crowned champions of the Futsal League for the 2nd time in 3 seasons. Xavier will therefore now represent our country, together with his club when they participate in the Uefa Futsal Cup in August 2018. Career in coaching – Xavier coached San Gwann Futsal for 2 seasons (2011/12 & 2012/13) in which he won promotion in both seasons (2nd to 1st division and 1st division to Premier) and also coached Valletta Futsal during season 2013/14 with whom he also won the 1st division and eventual promotion to the Premier division. 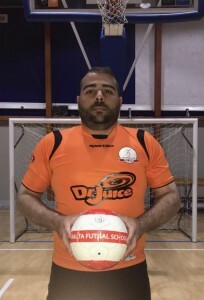 Xavier is the current coach of Valletta Futsal Club. Valletta FC have just been crowned champions. Xavier has been coaching with the Malta Futsal School since September 2014. Qualifications – Xavier has obtained the Basic Futsal Diploma Course organised by the Futsal Malta Association and Coaching Young Footballers (CYF) License. Xavier will be starting his Uefa Licence C shortly.